We make spectacular shows that exceed all expectations. Our regular residencies draw upon stories from around the world. Every participating child makes their own puppet and is also involved in making larger collectively constructed larger puppets. We bring in a team of two to five trained, experienced and highly skilled artist puppeteers. We can work with up to 250 children in a week. The fundamentals of our practice are that what is made by the children is THEIRS and is EXTRAORDINARY. The children do everything. 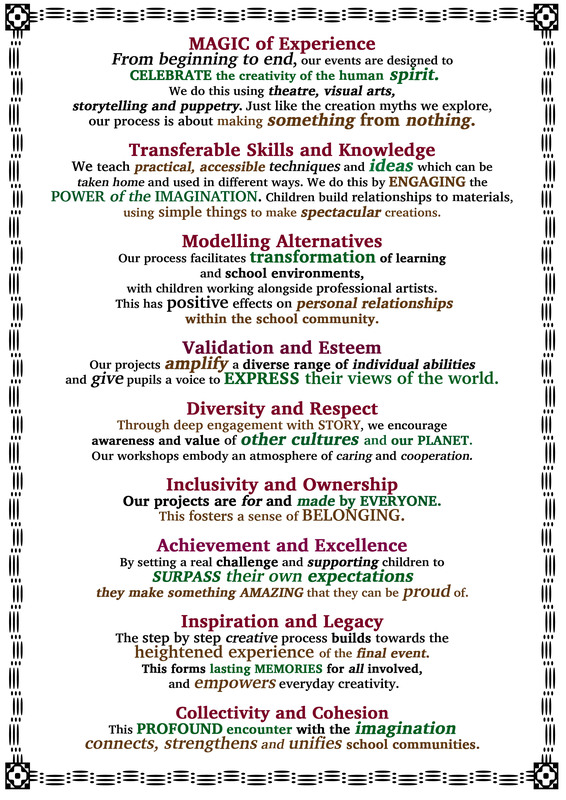 Making these large scale shows in a short amount of time has proven itself to positively affect childrens’ self image and the way whole school communities view themselves. Creation Myths are tales of creativity. They tell the story of the relationship between the infinite and the finite – no matter how small that finite creation seems. There is a deep correspondence between making a magnificent puppet out of recycled cereal packets, producing a spectacular show with a whole school and creating a universe. This correspondence resonates with the children. In the first session we introduce all the children involved to the challenge ahead by introducing them to the story, puppetry and asking them what they need to do to meet the challenge. Each class group then has a half-day workshop to make age appropriate puppets that are relevant to the tale we are telling. Then we rehearse the puppets, devise the show and write the script in a day (and it is unbelievable how accomplished the children are on this day). There is a dress rehearsal in the morning the next day and then one or two performances in the afternoon or early evening; whichever suits best. We also provide training, expanded projects that require funding, and carnival style processions. The creation of the world did not take place once and for all time, but takes place every day. We’re creating something in the same way the sky god did, we’re moulding little people only the sky god used mud and we’re using newspaper. Teacher: what are you making? Girl 2: Actually we're creating life. Pupils 9 years old The Study, Wimbledon.